Are you looking for a new way to send images to friends with a twist? Or maybe you've just been reading a few too many John le Carré novels lately? 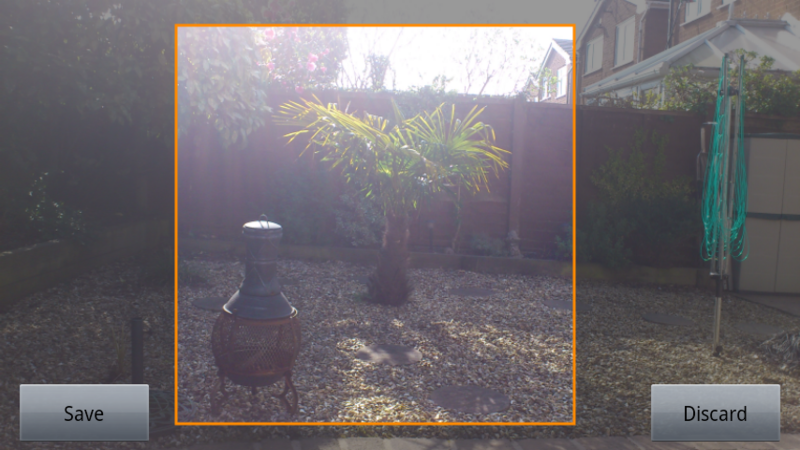 Either way, you may be interested in this neat little application that's available in both paid and free versions for Android called Camopic. 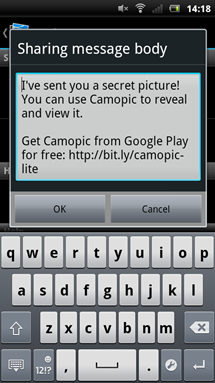 Camopic, like many apps that are available for Android, allows you to share images with your friends, but when both parties are using Camopic on their phones, the true image that is being sent can be hidden behind another one. 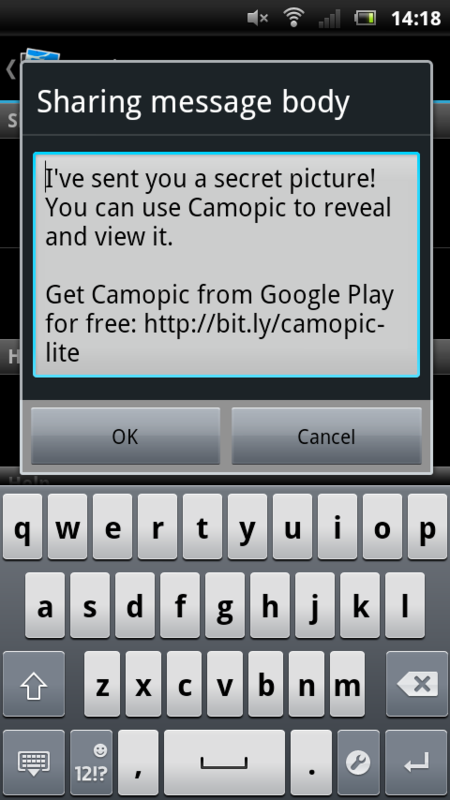 The user interface of Camopic is as about as simple as one can be. 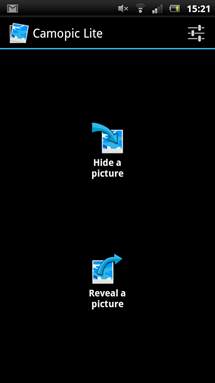 The opening menu offers a straightforward, if not slightly underwhelming, choice of 'Hide a picture' and 'Reveal a picture', and you can access the settings through a button on the top right corner of the display. Although the settings button is visible in every screen of the application in the same place, it could be slightly confusing for users who are finding their way around for the first time. Curiously, pressing the settings button on your phone doesn't open up a sub-menu at the bottom of the screen as you might expect it to do either. The user interface certainly isn't the worst that I've seen on an Android device, but it could do with some spit and polish to make it a little more consistent with other Android applications. 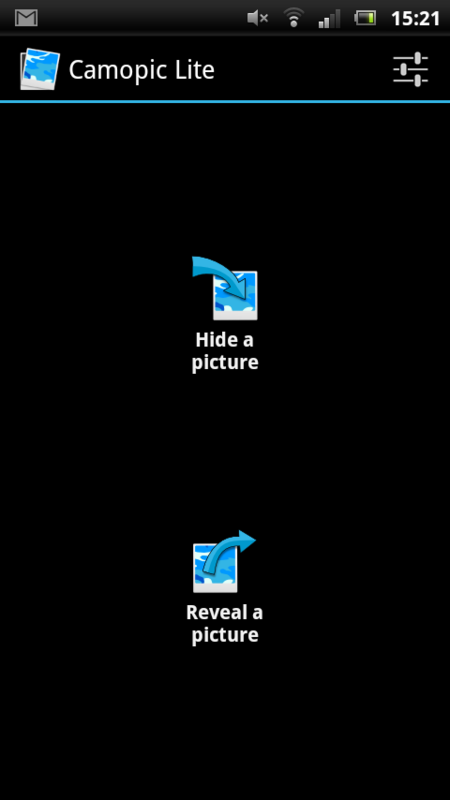 To hide a picture, simply tap on the 'Hide a picture' option in the main menu. This will take you to a screen that allows you to choose two images: one for your camouflage and another for the picture that you actually want to share with others. To choose these images, you can tap on the square of the image that you wish to select, and you will be prompted to either capture an image using the camera on your phone or choose one that you already have saved in your gallery. When you have selected an image, you have to crop it down to a square in order to share it. The controls here can get slightly clumsy and I ended up selecting a very small section of the image a number of times before I could utilize pinch-to-zoom properly, but you quickly get your head around the quirks of the app here. It might be helpful to include permanent handles on the edge of the highlighted area here so that these can be adjusted more easily by the user without having to resort to guesswork when you're trying to find the sweet spot for making the area bigger and smaller. Once you have your images set up and ready to share, you can hit the share button at the top of the screen to open a standard sharing dialog with a vast selection of places to send your file to. 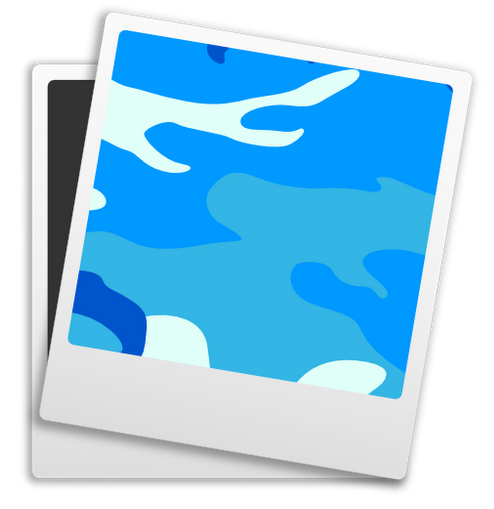 In the paid version of Camopic you can share as many images as you like, but the free version is limited to 5 shares before you have to upgrade. Be careful, as this seems to be measured by the number of times you tap the share button within the app, not the amount of times you actually share something, so you could run out of shares before you've sent anything from your phone. 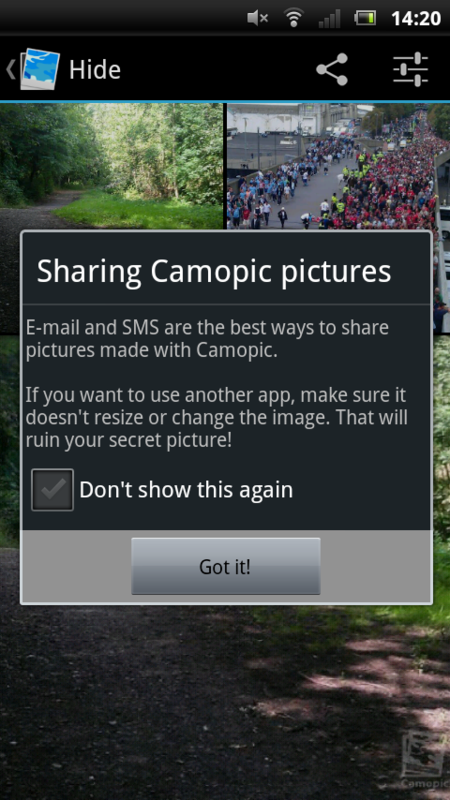 If you share a lot of images through Camopic, you might find it useful to change the default message subject and body content in the settings of the app. You can also choose whether or not you'd like to include a watermark in the corner or the image here, too. Once you've tinkered with the settings and everything is set up as you'd like it to be, you can hit share and show your secret image to your friends. Of course, that isn't much use if they can't reveal the image that they receive on the other end. Fortunately, doing so is made really simple. 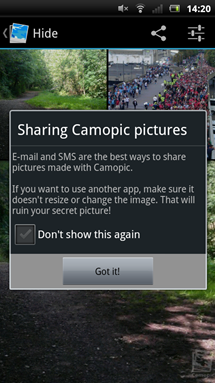 At the main menu, all you have to do is tap on 'Reveal a picture' and then select an image that you have in your gallery that was created using Camopic; that's where the watermark comes in handy. 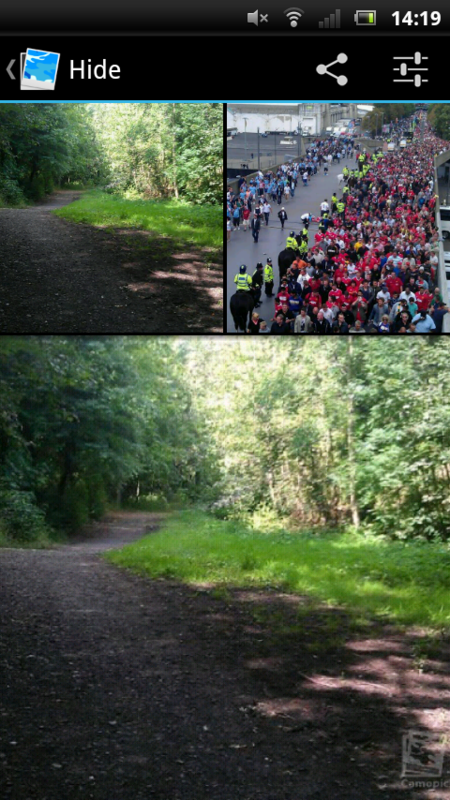 When the image is loaded in the app, you can tap on it to reveal the true image that's hidden underneath the camouflage. 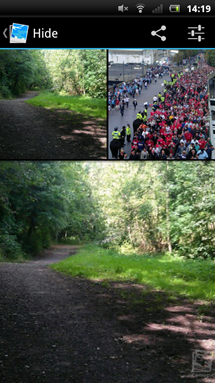 Tap again and the secret picture will disappear, to be replaced by the camouflage image again. There's no denying that Camopic requires a bit of work to perfect a few lingering issues, but considering that this is an early version of the app, it's made a solid start. I'd like to see a more inviting main menu in future releases, as well as a few tweaks to the image masking section of the app, but it was completely stable when I was testing it on a Sony Ericsson Xperia Neo under Android 2.3.4 and didn't crash once. If you want to check Camopic out for yourself but aren't convinced that it's worth your hard earned 99 cents (it probably is), you can check out the free version first, both are listed below.